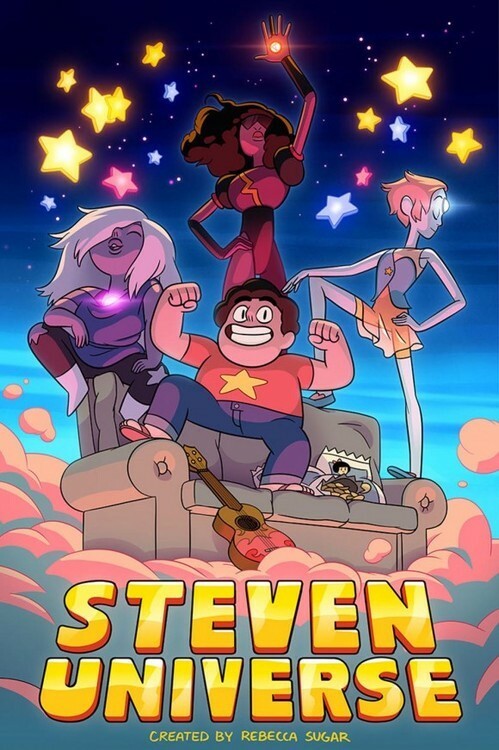 Slated to debut in 2013, Steven Universe is a coming-of-age story told from the perspective of Steven, the youngest member of a team of magical Guardians of the Universe. The animated series was conceived as part of the shorts development initiative at Cartoon Network Studios, and is created by Emmy and Annie Award-nominated writer and storyboard artist Rebecca Sugar (Adventure Time). Sugar is Cartoon Network’s first solo female show creator. Looks like there might be a few other good shows debuting on CN's 2013 slate as well. I like the sound of Uncle Grandpa: "Uncle Grandpa is based upon the Emmy®-nominated short of the same name and follows the exploits of Uncle Grandpa—everyone in the world’s 'magical' uncle and grandpa." I also like the premise of Clarence: "From creator Skyler Page, Clarence is a new original animated series about an optimistic boy who wants to do everything. Because everything is amazing!" With shows like these and Adventure Time popping up more frequently, and animated movies in theatres being good/decent more often than not (see: Pixar, Disney, recent Dreamworks offerings, stuff like Paranorman and Frankenweenie, etc. ), might we be in another golden age of original animation? Since this is cartoon network general chat, too - Powerpuff girls coming back, Young Justice going away. THE CIRRRRRCLE OF LIIIIIIIIFE! Updated Powerpuff Girls designs: yea or nay? I think they look fine, but I think I'd need to see them in motion first to judge properly. Feels like when I first saw the G4 pony designs. Nay. There's too much going on with them. The hair, the anime eyebrows, the weirdly perfect semi-circle mouths -- they're going to hurt to watch move. I like. Any out of the ordinary style is awesome to me. I would much rather have lots of crazy different styles all over, even if some were ugly, than a bunch of conservative similar styles. Looking at you mainstream anime/manga industry! Is that a real thing? Is there going to be more powerpuff girls? I'd watch it; I don't like this style as much; I think it's too southpark and it'd be harder to animate the squash and stretch that was so important to the original series, but it's cute. Just a short special they'll be airing later this year, as I understand it. If Craig McCracken is involved, then I'm all for it. I will miss Green Lantern. Oh yeah, that's the other thing they're cancelling. Why are they canceling all of the good shows. First The Avengers: Earth's Mightiest Heroes, and now this. I hope they don't cancel the new TMNT. Well, TMNT is not on Cartoon Network, so it might have a chance. Might. I don't watch any of the current superhero cartoons, so it doesn't really affect me, but I do feel for the people who have been watching. They sound like really good shows, for sure. Definitely sound like they should have been given more credit by the network. I can't wait to see Steven Universe. I've been looking forward to that. The reason I am not on board with the new PPG designs is because they look too little golden kids book. Sorta inspired by a Tiny Kitten Teeth sort of look. I just don't think it would really work for a PPG story. I didn't know Viga was in this show. So... it was funny to me when I realized I went to school with Steven. Me and Chie had classes with him, and he helped teach me flash. He did not produce any superpowers from his belly button. Oh My God. Tonights episode... Awesome. oh! now I can't wait to get home and watch it! Steven sounds voice sounds off. Did the voice actors change? Oh, it is an awesome episode. Why can't they be longer? Some of them will be appearing at MAGFest too, as to why that still remains a mystery.